We’ve paid embarrassingly little attention to Manitoba at First Reference Talks and our sister publication Inside Internal Control. But that’s all changing as the province that sits on Ontario’s western shoulder (presumably Ontario’s “angel” conscience) has set out to distinguish itself recently. Last month I wrote about the province eliminating the small business tax. And last November (brrr!) I talked about the province’s new psychological harassment regulation. Now the province has stood up with Alberta and Quebec against the prospect of a national securities regulator, arguing that securities regulation is solely a provincial matter and that the current system works better than a centralized one would. It looks like British Columbia, New Brunswick and Saskatchewan are also suspicious of the federal government’s plan, but have yet to throw their hats in the ring. I’m not sure if supporting the status quo is really taking action, and I doubt this will discourage the federal government, but there you have it. In any event, it will be a while before we see any movement on this case. But stay tuned! With Manitoba increasingly asserting itself, we’ve prepared a Human Resources PolicyPro specifically for the province; okay, actually for Manitoba and Saskatchewan. You can share right? Alas, you’ll have to wait until late spring to get your hands on it, but man will it be worth the wait. For more information about the Human Resources PolicyPro — Manitoba & Saskatchewan Edition and the PolicyPro Library, or our other HR products, call 1-800-750-8175, or from the GTA, 905-761-7305. 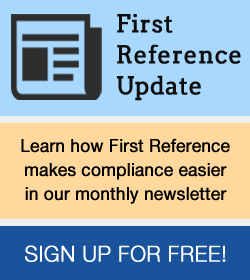 You can also send an email to info@firstreference.com or visit our website at www.firstreference.com for further details.